Story: It’s three years after the first game and the Marker has left Issac Clarke with permanent hallucinations. I guess he is still seeing necromorphs everywhere and it appears he was in a mental institution or a hospital and broke out. Some woman/group is helping Issac survive. 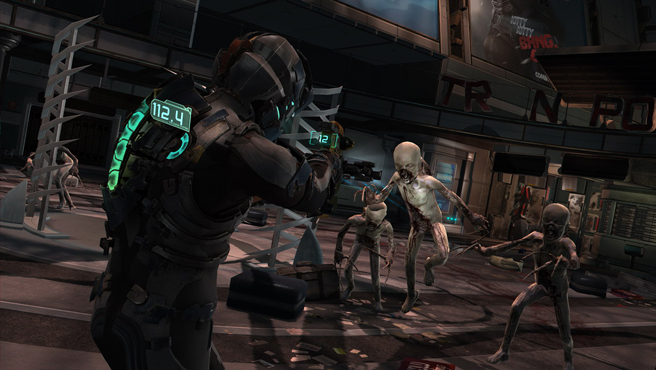 My guess is that Issac is murdering humans now and the necromorphs aren’t on the loose. Anyway, it seems like humans are trying to stop Issac since the gunship from the trailer makes an appearance at the end of the demo. Controls: The controls are almost exactly the same as the original. There is the improved looking melee attack on R1 and the brutal looking stomp attack on R2. If aiming using L1, then R1 fires the gun, R2 is the alternate fire, triangle is the stasis ability and circle is the object telekinesis. L2 by itself is the run button and select once again brings up the menus which still appear in game real-time. For me, it took a minute to remember to use all the controls and they still work well. I left the darkness settings at the default and the game appeared darker than I remember but it’s probably because I changed the settings in the past. The graphics were on par with the previous game yet the game style is more gruesome. The death scenes were visceral and when I lost to the mini boss in the demo (because I was using the slow reloading line-gun weapon), Issac lost his hand, his head and his torso. 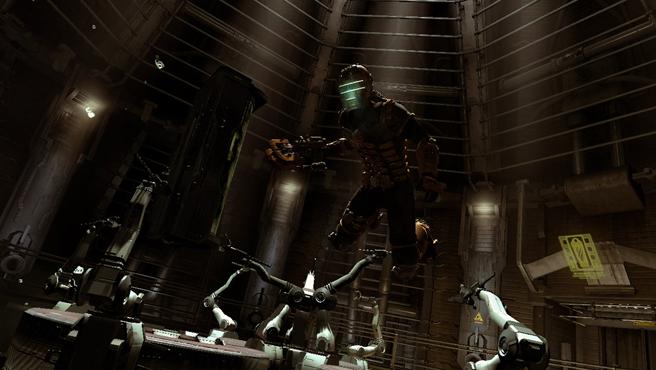 EA has done a great job making the player know Issac by having him appear with his helmet off when upgrading his suit and most enemies will take off his helmet so the player can feel moved at a human dying instead of a emotionless robotic suit. New Features: A new feature was the ability to hack a console by slowly rotating the control stick to find the right point in a circle. Keeping the selector on the red part makes the time run faster. You have to select blue area which appears in a random area of the circle and press X. The first time I actually died when time ran out and it was unexpected. Perhaps if my health wasn’t critical, Issac could have taken the console overload. After selecting the blue areas 3 times, it rebooted the zero-gravity console. The second new feature is the ability to navigate zero gravity in select areas without being forced to jet towards surfaces like the original. The demo has Issac press L3 to float slowly around the room and head vertically through a small seal lock and slow down a cooling fan. 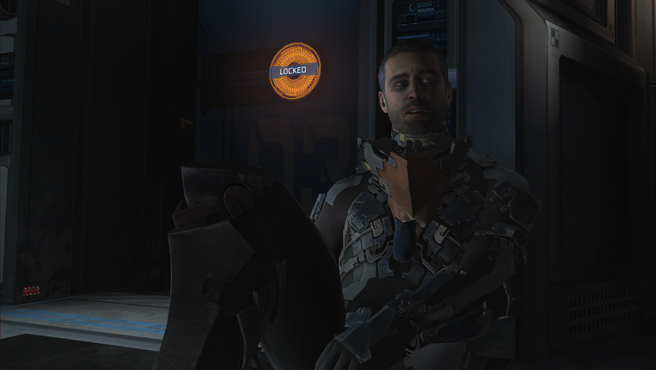 The zero-g navigation works well but there wasn’t any zero-g combat in the demo. I should have tried out the melee and kick buttons while floating to see if that is an option. Enemies: The enemies were about the same as the first game. I don’t remember if the puker necromorph was in the original game but I liked its ability to attack from a projectile range. I was surprised when it launched its head at me and exploded on impact (don’t worry, the necromorph gained another head somehow). There were some small child looking enemies but their tenacity was diminished by using the stasis power. There is still the baby style kick but it looks like Issac’s football kick skills have weakened from his hallucinations. Weapons: A quick discussion of the weapons is necessary. The first weapon, the cutter, is still the best. The machine gun was more effective than I remember. The Javelin gun was powerful but once in a while the enemy didn’t die from a huge spike through their body. Whatever The Line-Gun was really bad to use against the mini boss and felt worse than the fusion cutter. I rate it the lowest out of all weapons including melee. The melee punch is faster and one necromorph didn’t block the blows like they used it. Also, after using the stomp attack for a while, Issac starts swearing/saying random lines probably because he is wondering who would be stomping the ground more than 5 times in a row. I’ll probably wait to play the game on PC since I recently saw the first game running and it is much crisper than the PS3’s graphics. For people with only a PS3, this is still a solid demo and ran really well on the system. 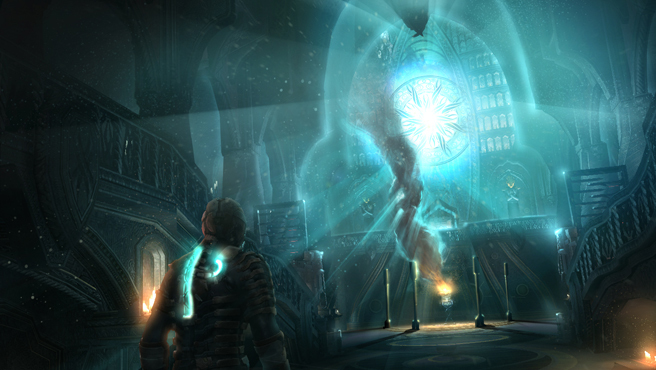 Discover Issac Clarke’s story when Dead Space 2 comes out really soon.